Zheng He (1371-1433) - There are not many well-known explorers in Chinese history. A primary reason is that, while China has consistently tried to expand its borders, it rarely expressed interest in exploring lands beyond its hegemony. One notable exception, however, is Zheng He. Between 1405 and 1433, he traveled to Southeast Asia, several islands of modern-day Indonesia, southern India, the Middle East and as far as East Africa (as shown on the map). These voyages were possible because he was a friend and adviser of the Yongle Emperor, the third emperor of the Ming Dynasty. In Medieval times such expeditions required state backing. Zheng He began as a servant of the future emperor, while only a boy, and at a time when the emperor was still Zhu Di, prince of Yan. He was captured by the Ming army and castrated (as was common for servants of the imperial court), and placed in the prince's service. Prince Zhu Di was the son of Emperor Hongwu, the Ming Dynasty's first emperor (see Zhu Yuanzhang). But Zhu Di did not succeed his father. The emperor named his grandson, Zhu Yunwen, Zhu Di's nephew as his heir. Once Zhu Yunwen became emperor (Jianwen), he began a purge of potential rivals (much as his grandfather had done). But Zhu Di pre-empted his own purging by usurping his nephew with the help of the court eunuchs, including Zheng He. This cemented Zheng He as one of the new emperor's closest confidants. He promoted Zheng He to Grand Director of Palace Servants. But the emperor had even bigger plans for him. Unlike previous Chinese emperors, the Yongle Emperor was interested in the sea. A year after coming to power, he began building his Treasure Fleet. In 1405 he appointed Zheng He commander of the fleet. 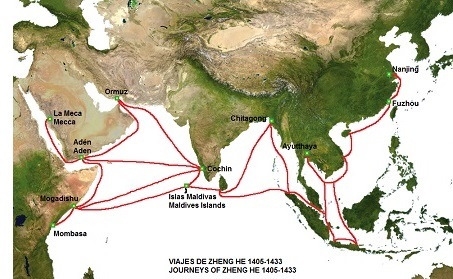 Between 1405 and Zheng He's death in 1433, China's Treasure Fleet would engage in seven maritime voyages throughout the South China Sea and beyond.